From the "What the Hell Took You So Long?" Department, I finally got around to watching Mimi wo Sumaseba (Whisper of the Heart) and Porco Rosso, two Studio Ghibli films. I'll address Mimi wo Sumaseba at a later time, but I think I can muster a few extemporaneous comments about Porco Rosso now. You're not going to catch me using the word "delightful" to describe a film, but Porco Rosso is a very charismatic celebration of director Hayao Miyazaki's love of aeronautics and his apparent fascination with pigs. It's an engaging story story about Marco, an Italian Air Force pilot who quits the military and becomes a bounty hunter to fight air pirates after his nation's turn towards fascism. It's set roughly around the early stages of World War II. Oh, yeah, I forgot to mention that due to a curse, Marco has been turned into a pig and now goes by the name Porco. The film is more than good enough to stand on its own merits, but viewers familiar with Miyazaki's other works will almost certainly compare it to the other films in his canon. 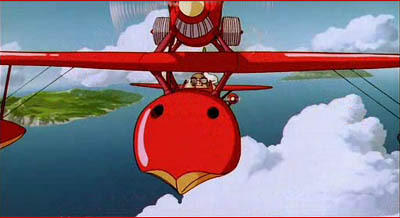 As mentioned above, two common Miyazaki staples are present: Flight and Pigs. There's more, of course. 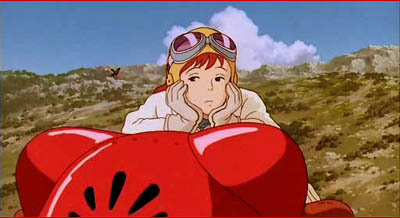 The young prototypical Miyazaki heroine in Porco Rosso is Fio. There's no question that Fio heavily channels Nausicaa throughout the film. Besides their obvious physical resemblance, Fio invokes much of Nausicaa's spirited, resolute willfulness as well. Also, they're both closely involved with aircraft. And, at the risk of catching Hell for saying so, they're both total babes. There are a few significant differences between the two that I suppose I should point out: (a) Fio lacks Nausicaa's aristocratic heritage; she is an heir, but one of a different sort that doesn't demand the same sort of dharma in her actions (or give rise to the bloodlust that Nausicaa is occasionally forced to embrace). (b) Fio differs from Nausicaa in the sense that the latter is fearless whereas the former is brave; although this distinction may seem somewhat narrow, I believe it is a fairly important one. (c) Despite having a slight edge in both maturity and precociousness, Fio is (somewhat curiously) depicted in a less sexualized manner than Nausicaa. (d) Also, practically as an afterthought, Fio's similarity to "The Girl Who Loved Insects" is acknowledged directly within the film in a small aside — Fio, apparently, is "The Girl Who is Merely Ambivalent Towards Insects." The true stars of the film are the aircraft and flight itself. 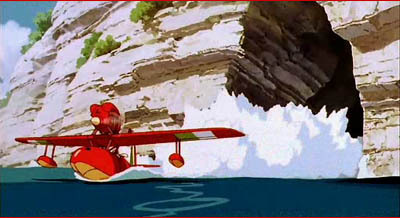 Always beautifully done in all of his films, Miyazaki's love of airplanes and flying takes center stage for much of Porco Rosso. I guess I should qualify this statement by pointing out that this is no small feat, as all of the characters in Porco Rosso (both protagonists and antagonists) are quite likeable in their own right—including even the children from the opening action sequence, which is no small compliment coming from someone with such open disdain and little patience for kids in general. 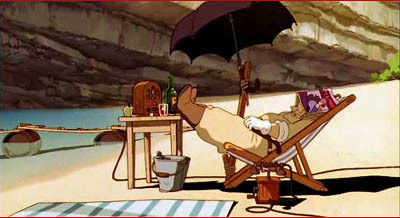 In short, Porco Rosso is another gem in a long line of great Studio Ghibli films. Fans of Miyazaki's other films will find familiar elements and many of the characteristics that make Studio Ghibli films so endearing. Viewers introduced to Miyazaki for the first time through Porco Rosso will undoubtedly develop an appetite for more.